Blend all of the ingredients together in a high powered blender. Add the pineapple juice gradually to ensure a smooth consistency. Add 1/4 cup of granola to the bottom of your bowl, then top with the pink Pitaya smoothie mixture. 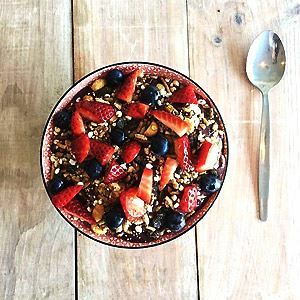 Serve with the rest of the granola and add the freshly chopped fruit to decorate. * Pink Pitaya can be found at most health food stores.